"Majority of club players lack а good understanding of typical mating combinations, piece maneuvers, and sacrifices which prevent them from delivering over 85% of checkmates. Sounds familiar? This course will fix it!" Checkmating opponent’s king is every player’s dream. It is the happiest, most exciting moment of the game. It is the most satisfying part of chess. However, the majority of club players lack a good understanding of typical mating combinations, piece maneuvers, and sacrifices which prevent them from delivering over 85% of checkmates. They struggle finding important clues and simply don’t attack. How many times have you missed a mating opportunity during the game, and discovered how simple it was in a post-game analysis? Perhaps, you even lost the game that you should’ve easily won. This happens to everyone, and especially to those under-2200 players. Does this happen because of poor calculation skills and tactical flaws? Not necessarily… chess players are NOT computers and CANNOT calculate everything. Even the very best Grandmasters play based on their knowledge and intuition. That’s why a good understanding of typical mating ideas, attacking patterns, and piece coordination will tremendously simplify your raw calculation work. By recognizing an opportunity in the right moment, you will just focus on analyzing those important variations, instead of wasting your energy on irrelevant lines. It is a very important practical skill to have – to know exactly how to checkmate opponent’s king, based on various positional and strategic factors. 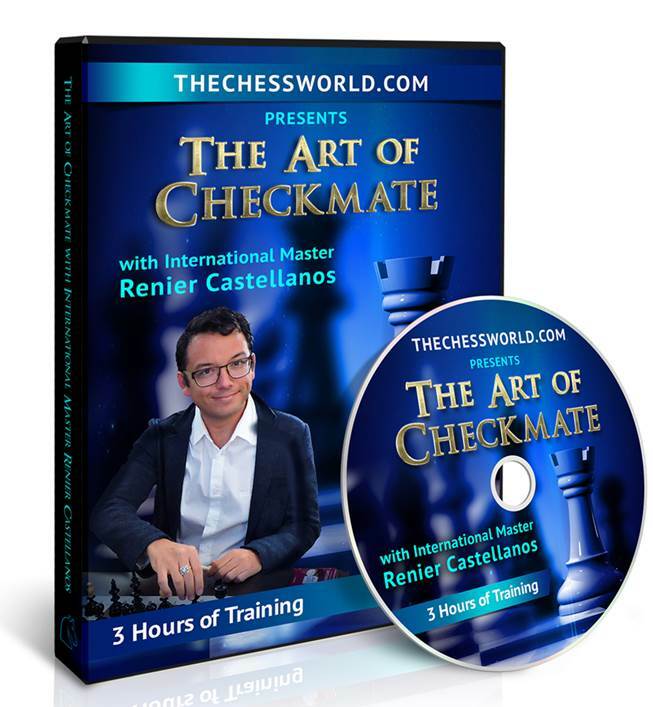 IM Renier Castellanos will teach you everything you need to know about checkmating your opponent’s king from typical positions including fianchetto, opposite side castling, same side castling, attacking an uncastled king, attacking a king in the center and much more. It took IM Castellanos years to structure those things. Previously, he was only sharing his secrets with a select few of his students (many of which became very strong players themselves). Now, these groundbreaking ideas are available to you! Armed with this knowledge and following IM Castellanos advice you will always be on a lookout to start an attack. Your play will become much more aggressive, and you will start winning many games by force. Do you want to become a stronger attacking player? Do you want to learn when and how to start a checkmating attack? Do you want to learn 18 typical checkmating patterns that all GMs know? If you answered “yes” to any of those questions above and you are under 2200 rated this course is for you! 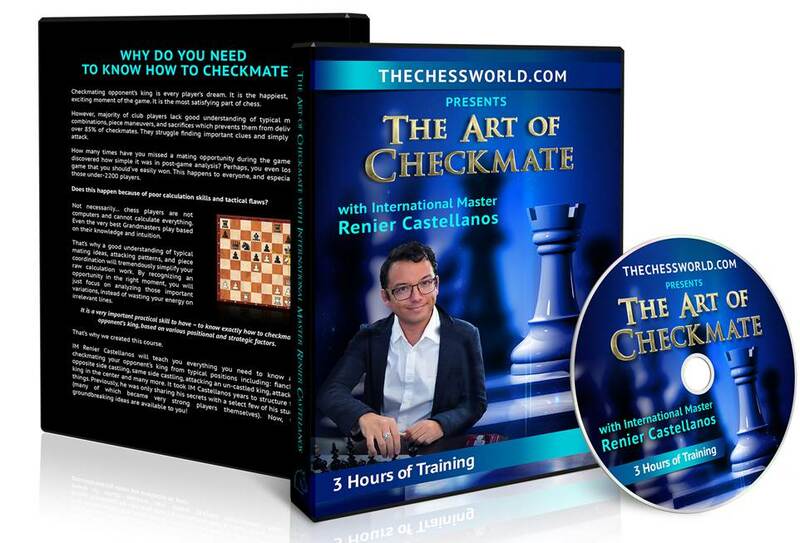 Instant download of the 3+ hour long, video course with IM Renier Castellanos. This video course covers the most important ideas and mating combinations that will help you finish many of your games in style. Want to win more games? Learn more to checkmate! How grandmasters find an instructive plan and start a powerful attack even in most complex positions? How strong players read their opponent’s intentions and always stay one step ahead? What is the fundamental plan allowing to dominate in opposite castle positions? How grandmasters use the h3/h6 hooks to open up the positions and extract the opponent’s king? How strong players prevent their opponents from castling and destroy their king in the center. How grandmasters find the forcing moves and prevent any sort of counter-play?